In the wake of Sandy, I have seen numerous articles by prominent folks in the field of meteorology get published in mainstream publications tackling the "meteorology deficit." In the Wall Street Journal last week, Kerry Emanuel, a professor at MIT, and one very familiar with hurricanes, penned an editorial bemoaning that the US has falled behind in storm forecasting. The incoming president of the American Meteorological Society, Marshall Shepherd, wrote a blog entry and conducted an interview with the Atlanta Journal Constitution discussing why Europe had "the first word" on Sandy. Dr. Cliff Mass of the University of Washington wrote a two part essay months ago on why the U.S. has fallen behind in numerical weather prediction as a whole. Much of this stems from the fact that the heart of numerical weather prediction in the United States is the GFS model (Global Forecast System). For all intents and purposes, the GFS is not a truly awful model. 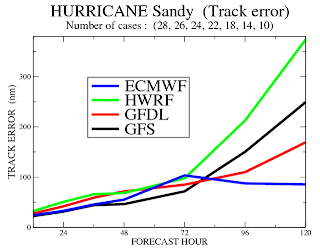 But in many situations (most notably of late during Hurricanes Isaac and Sandy), the model from the European Centre for Medium Range Weather Forecasting (ECMWF, or Euro) has not just beaten the GFS...it has obliterated it. 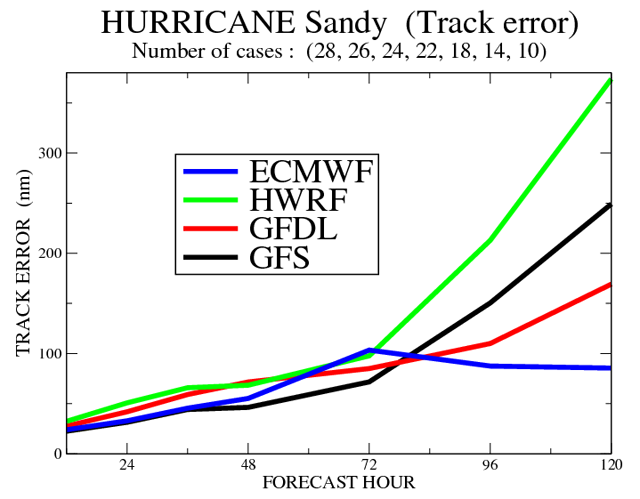 The image to the left shows the Hurricane Sandy track errors from two hurricane models (GFDL & HWRF) and the two main globals, the GFS and Euro. This image is credit Morris Bender of NOAA and Jeff Masters of wunderground.com. Notice who won HANDILY 5 days out. Why is the European so good? A number of reasons. First, their computing power is vastly superior to that of the US. More time and money has been invested in ensuring the computing power of the Euro is top of the line. While the computing power of the GFS is massive as well, it still lags the Euro in quality. Second, and probably most importantly, the data assimilation scheme used by the models differs vastly. The Euro uses a four dimensional variational method of data assimilation. 4D-var is much better than 3D-var, which is what the GFS uses. 4D allows you to view a time dimension, rather than just the three dimensions of the atmosphere. This helps tremendously, and we see this reflected in the frequent forecast supremacy of the Euro. If you're looking for more, a paper from the UK Met Office, published in 2005, addresses why 4D > 3D (besides the obvious). So much about the model, from the initialization on down makes it perform better in most cases. Yes, the GFS will occasionally score a coup, but beyond days 3-5, its accuracy diminishes greatly. Cliff Mass has determined that the US needs 32 times the amount of current computer power to match the accuracy and quality of the Euro. This is clearly a problem. In a fiscal belt-tightening world, this is an even more daunting task. But the cost is quite literally a drop in the bucket, especially given the amount of economic and infrastructure damage we are vulnerable to as a nation because of weather in general. But you can now see why the Euro is considered the gold standard. It is far superior in so many ways to what we use here in the US. We will eventually catch up, but hopefully it's sooner than later.